Yep, you read the title correctly. Sounds a little weird, I know. But weird or no, it's also DELICIOUS. Trust me here, peeps. Have I ever steered you wrong? I found this excellent flavor combination on Pinterest. And then I started experimenting to see if I could re-create the fabulous picture which set my mouth watering. The ingredients are basic, and the method simple. Even the Hubs could make this yummy grilled cheese (not that he actually will, but he could. In theory). This was so good I, ahem... tested it several times, with different variations. I know this doesn't look like my regular ingredients photo, but it's because I tried this several times. 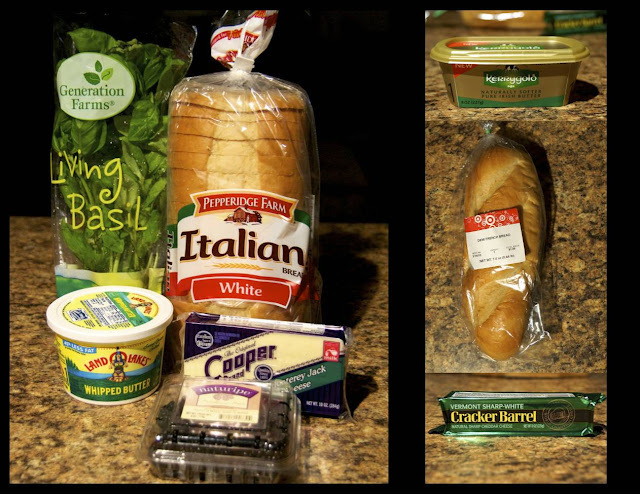 The first time, I used Italian bread, Monterey Jack cheese, blackberries, basil, and butter (for the bread). The second time around, I changed the cheese and bread. And the butter. (But I only changed the butter because our commissary started stocking Kerrygold, which is pretty much the best tasting butter you can get here in the States... that I've tried so far). The word you're looking for is... ANYWAY. Ahem. Back to the recipe. What I've discovered is, this recipe is highly versatile. Naturally I have a few tips for you. But for the most part, this dish is pretty impossible to screw up. SO. The bread. You can pick your favorite, but choose a thicker cut. You definitely don't want a skinny mini bread. The blackberry juice and gooey cheese will disintegrate a bread that is too thinly sliced. I found that I prefer to thickly slice my own French bread (Quick tip: If using French bread, you often find air pockets in the slices. Try to avoid them so your cheese doesn't melt through). Next, the cheese. Again, choose your favorite. I found the Monterey Jack was quite good, but the white cheddar was a-maz-ing. I really like the zing and the sharp kick from the white cheddar. I might try this again with Asiago or Stilton. Oooh, or Brie. Have fun with it! Now that you've got your cheese and bread (both essential to a grilled cheese), let's deal with the blackberries. Place the blackberries (6 oz) in a bowl with high sides. Why the high sides? Because we're going to squish those babies, and they splatter! Don't completely pulverize the berries, but squish them up so they're not too chunky. I'm way technical, right? Ha. You could also leave the basil leaves whole, and simply layer them on your sandwich later. This will still taste yummy and look pretty, but I find it harder to eat the grilled cheese with whole basil leaves. With all the prep work done, this grilled cheese comes together in a snap! Add another thin layer of cheese, then top with a piece of bread (Without the additional layer of cheese, the blackberries will soak your bread. Make sure there is something between your fruit and the bread!). Do you want to know the best way to get a perfectly toasted grilled cheese sandwich? I know you may be tempted to move your sandwich around in the pan, or smash it down with your spatula. But please, please resist those urges. Your bread may stick a bit at first, but it will loosen... I PROMISE. As the bread toasts, it will unstick from the pan. And that's when you know it's time for the flip. Wait patiently as the other side toasts as well. Don't turn up the heat, or any other crazy thing. The sandwich will cook about 3-5 minutes per side. 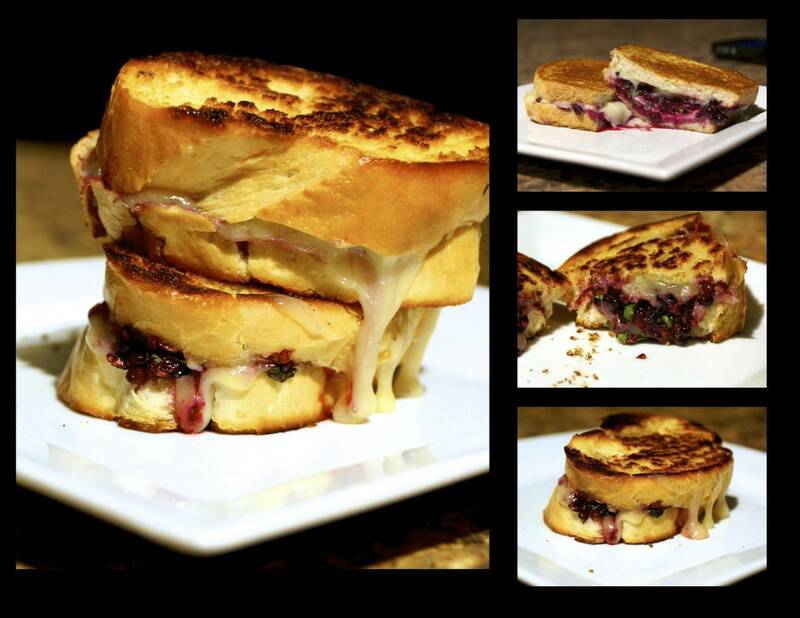 Enjoy the ooey gooey deliciousness that is Blackberry Basil Grilled Cheese. Yes, it really is that simple. Like I said, so simple even the Hubs could do it. Happy cooking, my friends! Please let me know if you try this with other cheeses or fruits, and how it turns out. As always, the traditional recipe is below. UPDATE: Recently, I made this grilled cheese again, substituting the blackberries for blueberries. The result? YUM! Butter one side of your bread slices, then set aside. Smash the blackberries with a fork. 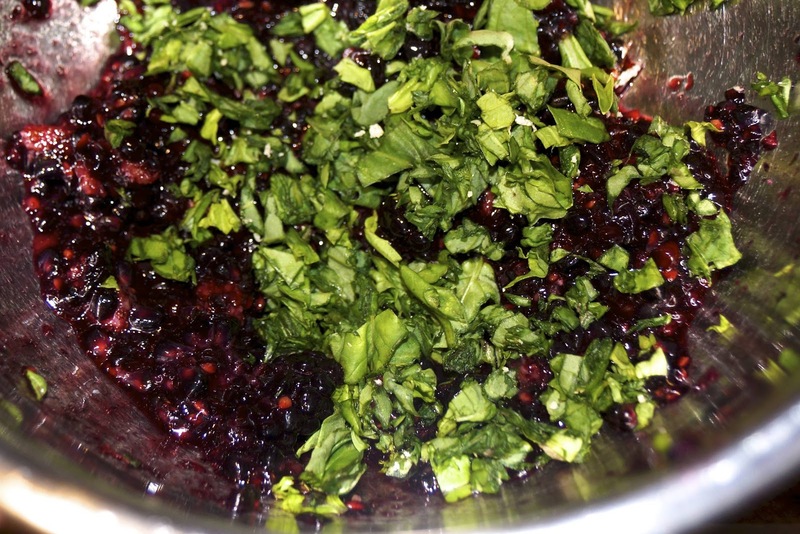 Stir the basil (if chopped) into the blackberries. Warm a skillet over medium-low heat. Place 3 slices of the bread, butter side down, in the skillet. Add a thin layer of cheese on each piece of bread. 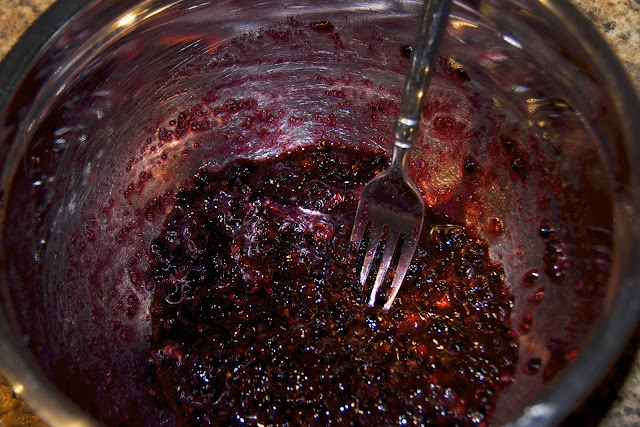 Top with 2 tablespoons of the blackberry mixture. 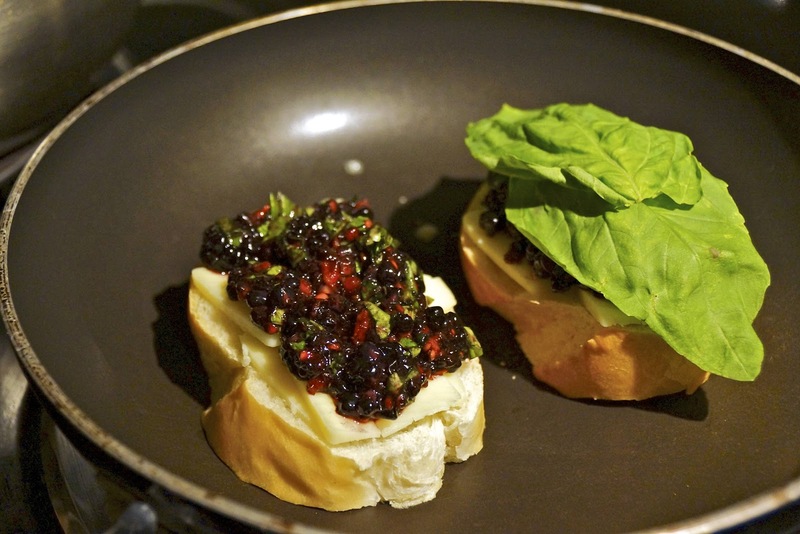 If leaving the basil whole, add several leaves on top of the blackberries. Finish with another layer of cheese, then top with the remaining bread slices. Cook for 3-5 minutes per side, until the bread is golden brown and the cheese is melted.